Being a writer is tough work, but there are ways to make writing easier on you. Today’s guest blogger, Ashley Sanford, is listing just some of the many tools writers can use to improve their writing. Whether these tools help organize you, keep you focused, or edit your grammar, these tools are bound to help some writers out there! So, if you’ve used one, let us know what you think, and if you haven’t used one, let us know which ones sound like something you would use. And—of course—if you have any additional tools you know about, tell us about them. As easy as it may sound to some people, writing is a difficult task and requires complete dedication of the writer. 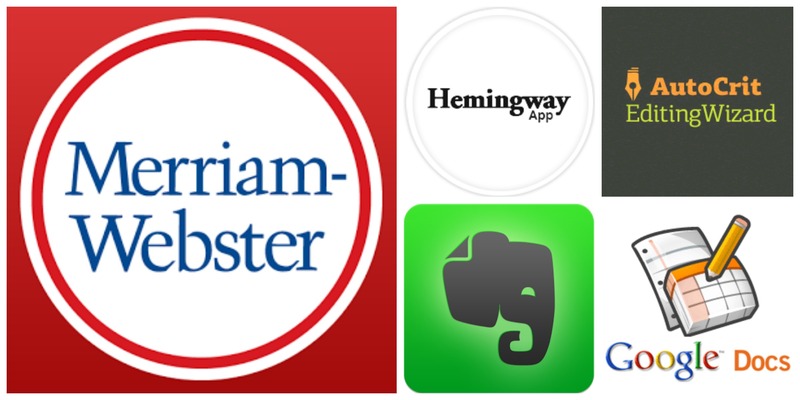 While you need a certain level of interest and skills to become a good writer or an editor, there are various apps and tools available on the internet which can help you make your life more convenient and efficient as a writer. Google Docs is definitely the most popular app among writers around the world because this is a complete package that any writer can ask for. With Google Docs, you can create content in any manner you want. Insert pictures, flowcharts, tables or simply change the style of writing with just a few simple steps. Google docs provide the writers and editors with a facility to write and edit their content anywhere or anytime, at their own discretion. The on-screen and off-screen distractions play a major role in distracting away the writer. While it is easy to tackle off-screen distractions like noises, television, etc., it becomes difficult for certain writers to pay close attention and type their thoughts with a colorful screen. So, if you are looking for just a plain canvas for writing, then this is just the right tool for you. It also provides features like alarm, goal setting, sound effects and timer so that you can organize your work or projects and do things more efficiently. This is a must-have tool for all writers, especially editors. You can use this tool for free, though a premium account is also available. With just a single click, you can check everything in your content and correct it right away without having to read each and every word carefully as it helps highlighting the problematic areas in the manuscript. You can easily edit and remove grammatical mistakes, over-used words and other mistakes with this tool efficiently. Don’t let the name fool you! Be it a novel, creative write-up or a dissertation, you can let your transcripts proofread and edited by a professional via this service. The service is ideal for people who find it a bit difficult to do editing on their own. Regardless, with this resource at your disposal you can get your projects polished to perfection whenever you want. Sometimes, the biggest problem a writer may face is the selection of words that will be best suitable to describe his idea. So, get this app right now if you do not want to waste your productive time brainstorming the right words. This free app is by far the most convenient way to finding the right words that help you convey your message to the readers in the best possible manner. This is a very popular app among writers and editors who want to do things in a well-organized manner, and on-the-go. You can save relevant pictures, screenshots, write even the lengthiest notes and search for your required document easily within the app with a search option anytime as per your need. All you need to do is sign in from your account, and you can access your entire collection of content, pictures and notes from any computer, anywhere in the world. Editing is indeed an intimidating task that editors have to do for ensuring the quality of their content. With quite a few apps available in the market to facilitate editors, Hemingway is an outstanding one with its great features and accuracy. All you need to do is to copy paste the desired content on this app and let it find mistakes for you. It points out all the sentences that do not make any sense or those that contain over-used words. Plus, it can identify any grammatical mistakes in your work. Once, you know how and when to use online tools and apps to facilitate your writing or editing, you will realize how easy and manageable your work can become. So, it is indeed a wise idea to take a look at all tools and pick the one according to your nature of work. Ashley Sanford leads the team of content developers. Apart from content development, she’s also fairly talented at art and designs, and she loves to roam Art museums in her country.